Keeping tack of information can be tedious. Many of us still resort to Excel (my personal favorite!) because it does a great job of keeping data in rows and columns. But what it doesn't do is remind you when you have an activity coming due. And it isn't very easy to share with others and ensure that you're all working off the same version. Using Statdash to keep track of information such as a marketing strategy or any other on-going workflow process works perfectly in Statdash. 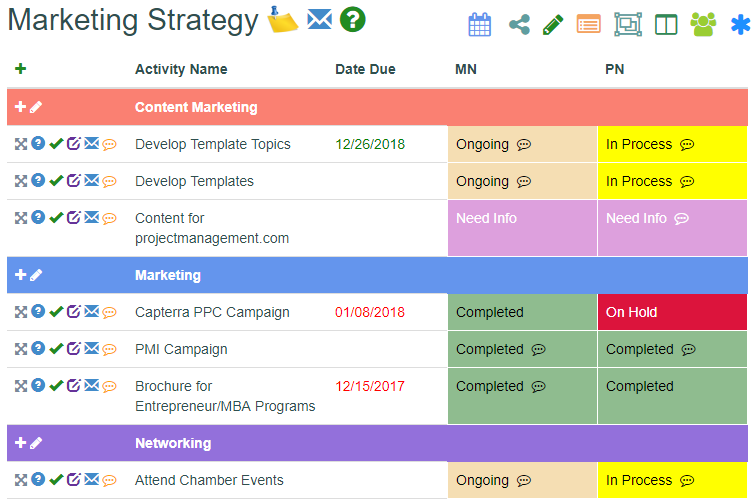 You can easily add activity categories to group your marketing efforts together. You can set start and end dates for each activity and create statuses that make sense for tracking your progress. You can view your activities in an interactive calendar and you can even share a read-only version with vendors or contractors. The exampe below shows how you can use Statdash to set marketing objectives and make sure everyone is on target.